Well I am here to do just that for you. 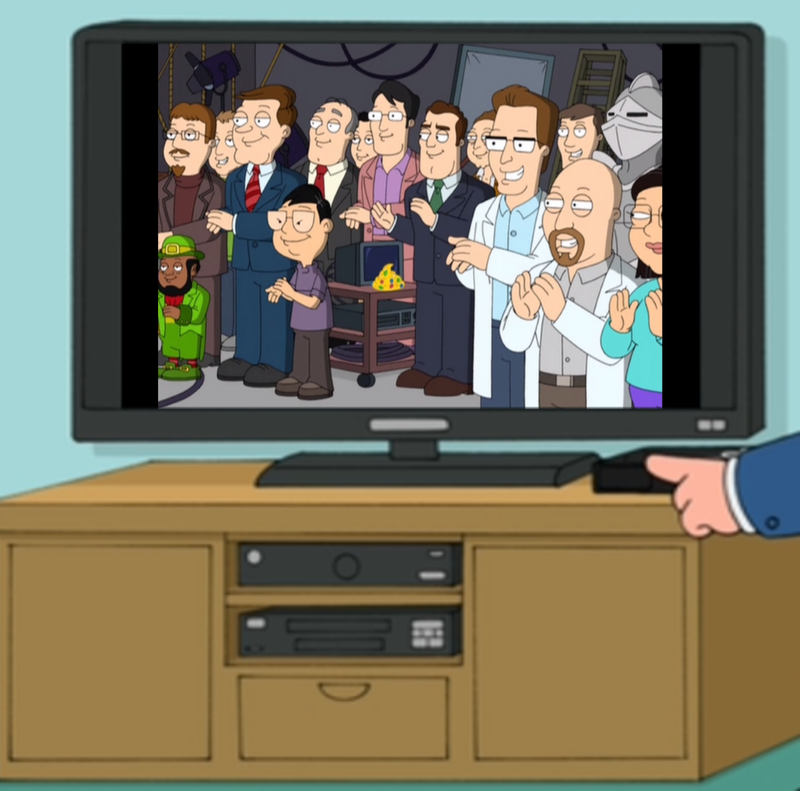 Let’s take a look at the Family Guy Series American Dad Series and find out just Where The HELL Did That Come From? 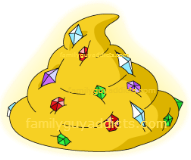 In this post, I will be covering the Origin of the Golden Turd. Stepping outside the normal Family Guy Series and into the American Dad one instead. Why is this in our game? What on earth does it have to do with American Dad? Why is it Golden? The Golden Turd is kind of a lil story line all its own. It pops up here n there throughout the series, Let’s take a look at the TV Episodes to find out just where. After being made to feel like he has nothing special about him, Roger tries to figure out just what he can do that will make him special in Steve’s eyes. Klaus of course messes with him. He later goes with Steve who is trying to run away. When they attempt to pull an E.T. move and fly off a cliff, but instead crash horribly in a power station. Roger gives up and goes home. The workers Jim and Mike come by later to check on the Power Station and find, a golden jewel encrusted turd. Jim is fascinated with it and knows it will make him rich…which drives him completely mad to the point of murdering Mike. Jim narrowly avoids suspicion of security and leaves the site as fast as he can. He gets to a gas station to call his wife and tell her they are rich…of course her lover picks up. Jim is devastated. And so begins the saga of the Golden Turd…to be continued. Stan has lost his edge and his mind after being persuaded by a car dealer one too many times. 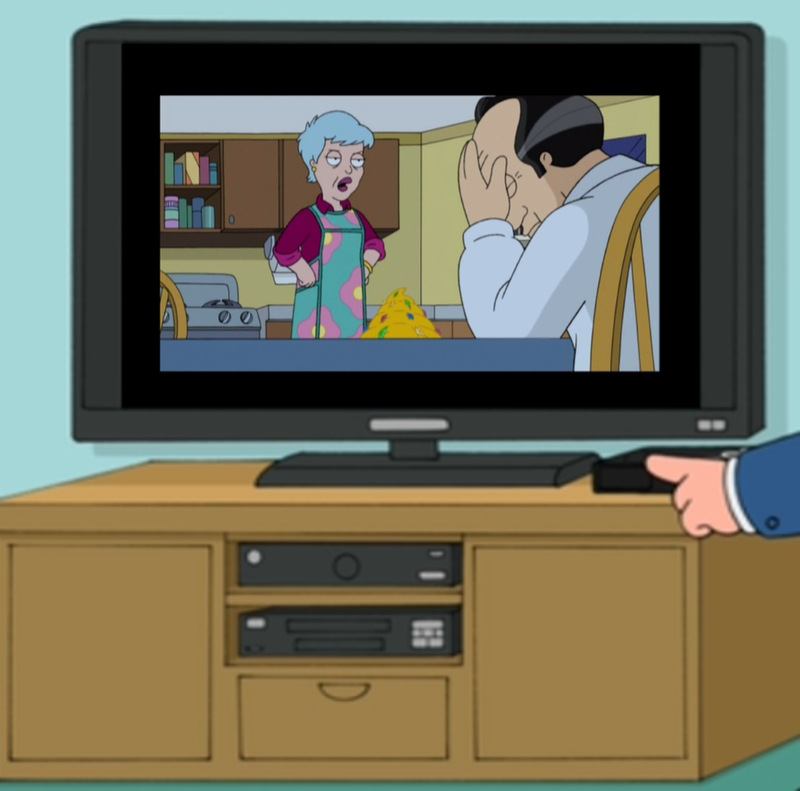 Him and Francine end up a complete mess. As they are in one of the many new cars discussing how they’re going to make money and get their lives back together…we see the DWP truck and Jim pass by…and so continues the Golden Turd Saga. Jim is a complete wreck. Worn and dirty clothes, driving erratically, drinking, and it is all due to the Golden Turd. He comes to a railroad crossing and contemplates what he has done. He pulls onto the tracks. Later two cops are at the scene trying to figure out why he did it. The Lieutenant, Eddie, finds the Golden Turd and tucks it in his pocket before the other officer can see him. He later is at home distraught he is almost retired and stole evidence from a crime scene, while his wife, Marylin, tries to convince him it was a good idea. They can retire to Boca Raton They argue over it. Eddie tells her is going out a good cop and will return it in the morning. She makes them some tea…and sprinkles some extra Rat Poison in his. Of course…to be continued. This one is just a quick glimpse at the Golden Turd. Blink and you will miss it. 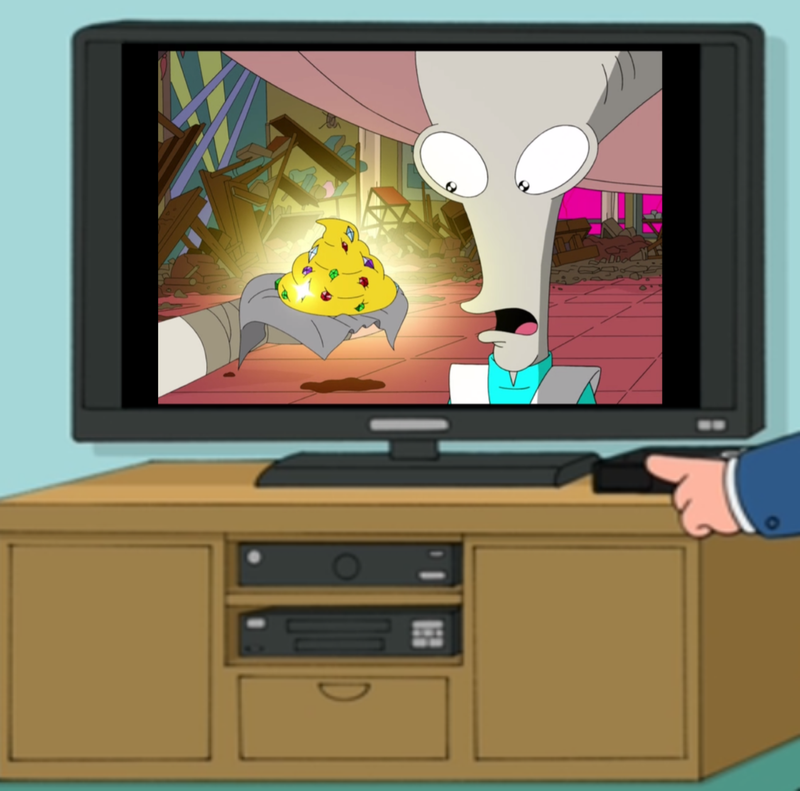 Roger is telling Francine about a pomegranate seed that was stuck in his teeth while she is in the kitchen. He makes a reference to how the pomegranate resembles a “Woman’s Baby Cannon”…of course this just so happens to be the 1000th joke about it. As they camera pans the crowd, you can see the Golden Turd resting by a TV stand in the crowd. The Rapture has hit town and Jesus is back in town. Hayley and Steve got taken with the others floating away. Roger just wants off the planet and goes in search of his spare parts to fix his Spaceship. Apparently Francine accidentally donated all the parts to Good Will. Meanwhile Francine and Stan get in an argument due to Stan wants to leave her behind and be raptured. She takes off and ends up running into the REAL Jesus at a diner. He asks her to be his girlfriend and she accepted. 7 years later…the Armageddon Wars are in full swing. Francine has been taken by the Anti Christ. Jesus and Stan try to work together to get her freed, but need some help. So they go to Roger of course. They tell him they need his spaceship to go rescue her. He informs them that it runs on precious metal, so unless they can poop out gem encrusted gold the ship isn’t going to fly. Jesus pulls out the Golden Turd from his pocket. He said found it during the battle of Boca Raton. They get the Spaceship flying and off to get Francine. Of course Roger crashes it while he tries to write a joke down. This one is just another quick glimpse. Roger is preparing some eggnog for the Holiday and Steve tells him to just finish up already. Fill his Pimp Cup and leave. Now looking at the Pimp Cup itself, it seems to be made of a very familiar jewel encrusted golden item. Roger and his new Alien girlfriend are out on a drive across the shoreline to see if their relationship can really work out. They pass by the Virginia State Prison…and it switches to the Golden Turd Saga. Marylin is strapped into the chair waiting for the lethal injections. She whispers, “I’m sorry son” to a man sitting in the observation area. Another man calls her a cop killer as the injections take their course. (Looks like they found out who killed Eddie.) Then it cuts to her son, Vincent, back home and saddened by it all. He is making his way upstairs to his old room. He cries over a picture of his family. He just does not understand. He thought they were just so good. Charles calls him to talk about Wyatt Bordon, one of the worst chemical polluters in the state. Charles reminds him he needs money for his upcoming election. How is he going to pay for it all? Vincent swears he will never get in with a person like Wyatt. He would rather lose the election then get in bed with that devil. Just then one of the kids outside is hit by a car and hurt bad. As he is about to run out, he steps on a loose floorboard in the room. When he pulls it up, he sees none other than the Golden Turd. He ignores the cries from the kid outside and places the Golden Turd into his suit pocket. Later at campaign headquarters, Vincent picks up the phone and calls Wyatt while gazing at the Golden Turd. Wyatt makes him smile by saying he would rather call him Mr. President. 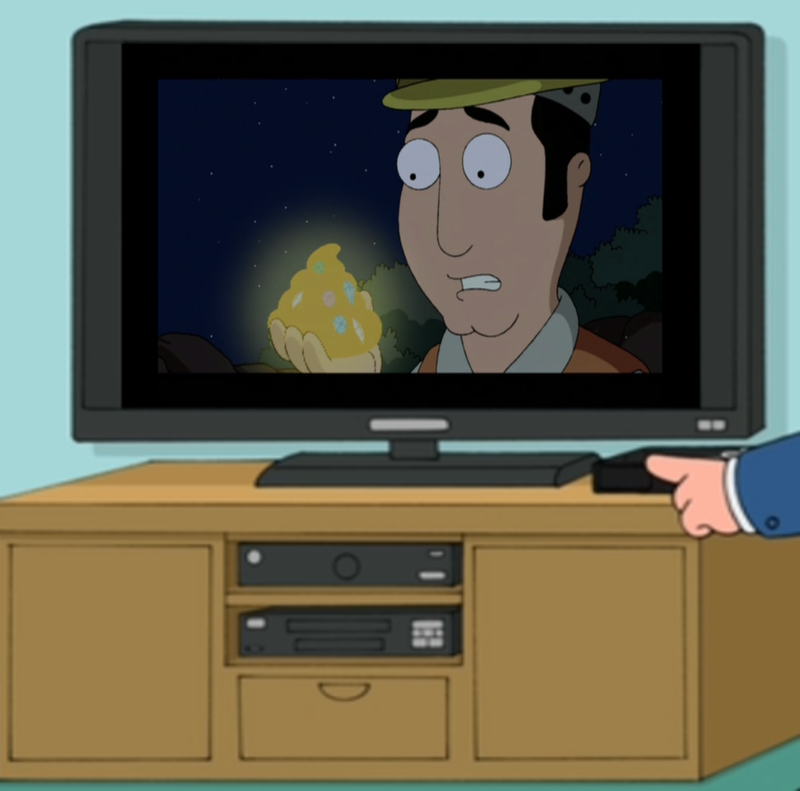 So an object that seems to have been made by or dropped by Roger is now spanning the series of American Dad in a continuing story line. Lol. What do you think of the Golden Turd? Have you won it in the Challenge yet? Got any plans for where you want to put it in your town? Laughing at a silly object now in our game? Let us know your thoughts in the comments below. 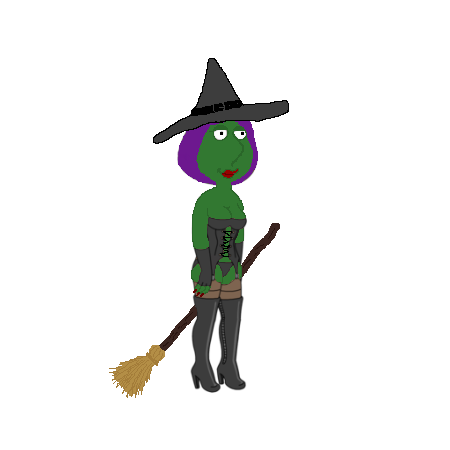 This entry was posted in Where The HELL Did That Come From and tagged American Dad Event Tips, American Dad Series, Family Guy Addicts The Quest For Stuff, Family Guy Tips and Tricks, Golden Turd, Jewel encrusted Golden Turd, Magic Drunken Clam Challenge, Roger. Bookmark the permalink. When does the golden turd drop? I cleared Roger more than the required time, and still I don’t have my turd? It is not in my inventory either! Did you see the popup saying you won it? If you did and still don’t have it contact TinyCo and let them know it never arrived in your game. I thought that the cup from season 7 episode 7 was the holy grail that they used to get Stan back from being excommunicated. Wish it was every 4 hours instead of every 4 hours after you clear him.. So really like every 9 hrs..
I’ve found the turd goes swimmingly behind the Alpha Dog Trophy. Haha! been waiting sooooooo long for american dad game. this …is…HEAVEN!!!! Spoiler alert: if you want to hear what Roger will say in the game. Find his squatter and tap him. will “Mind Quad” make it into the game too? it be cool to get that character and awesome to have him voiced because many might not know but a famous male adult star does the voice. lol but i can just imagine the cool tasks he could have with his mind powers! 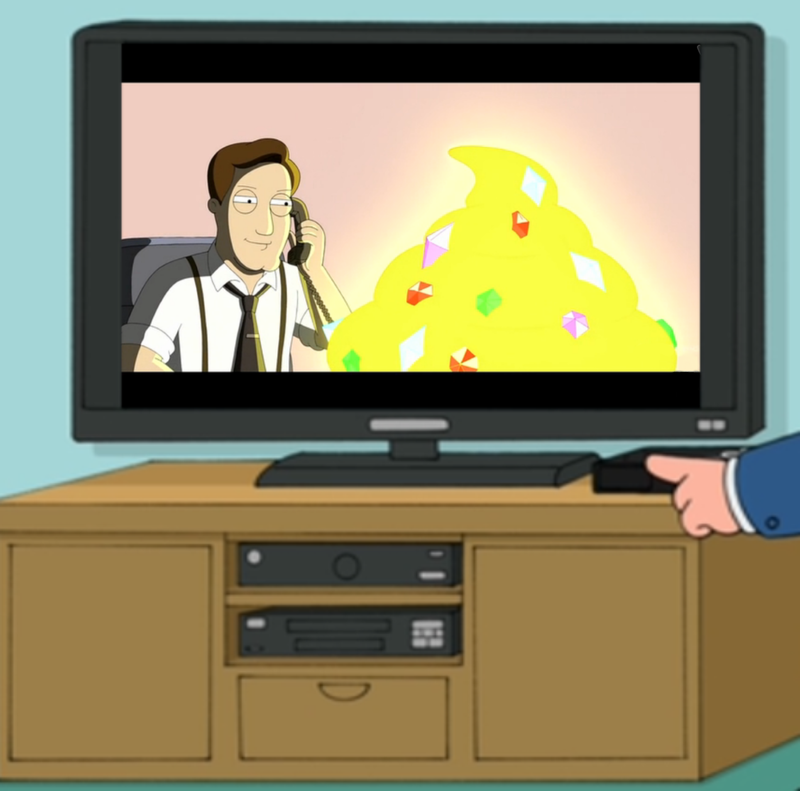 The Golden Turd and the squirrel stories are my two favorite American Dad diversions. Thursdays and Fridays are the standard….so up to them. I will be done with everything by 10 p.m.ish, just in time to start this week’s quests if they move them up to Thursday releases again. I prefer the Thursday evening releases as opposed to waiting for midnight Friday and then spending all weekend just doing menial task as was the case last weekend. Hint, int. Hey, I was just wondering where I can share/send you a ‘caption this’ image? You can send them to our Flickr page, you can provide a link here in the comments from your fav pic site like flickr, dropbox, etc. Or you can email them to us. 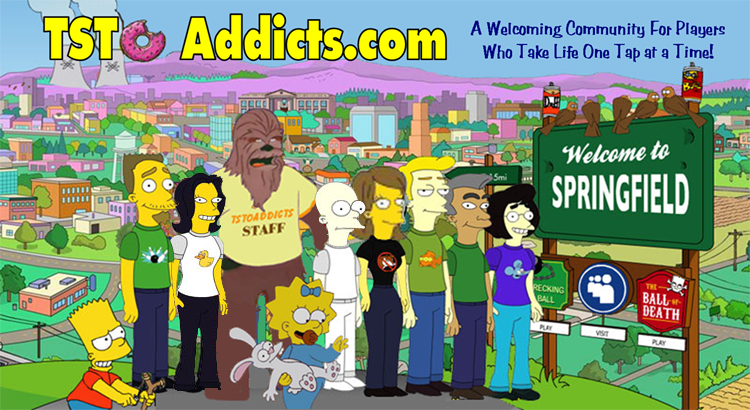 familyguyaddicts@gmail.com. I don’t much care for American Dad so I don’t much like this intrusion of my Quahog either. I can’t stand the Roger character in the show so that’s a majority of the dislike for it. 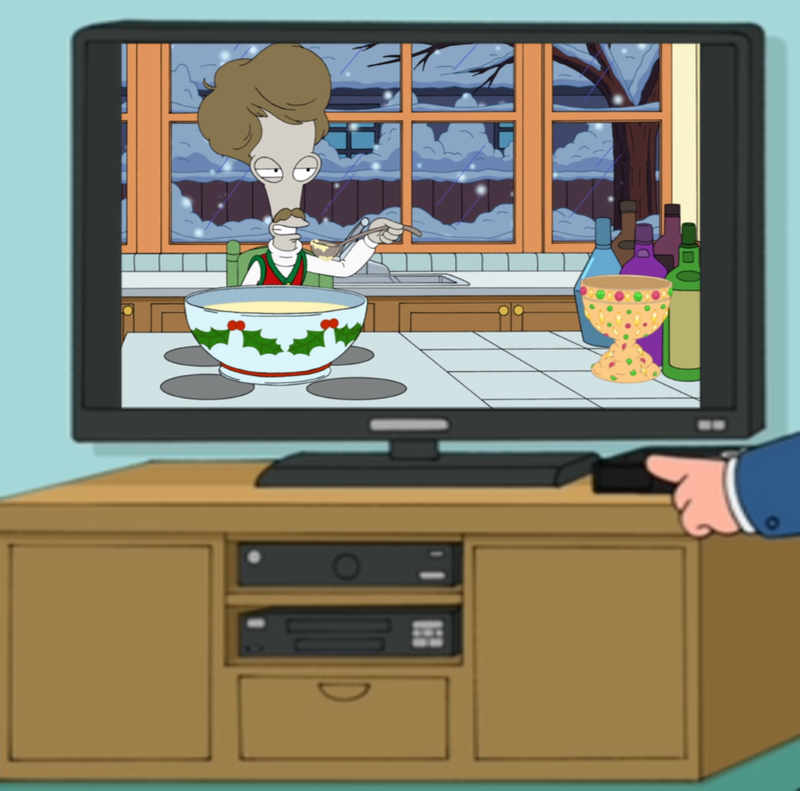 Season 5 E9 Rapture’s Delight is imo one of the best american dad episodes ever and easily one of tv’s greatest xmas episodes. Beat only by american dads xmas episode where Steve shoots Santa and the smiths go to xmas war. Very fitting considering the timing of the holidays is I upon us. Obviously the retail market has forgotten thanksgiving so why not start watching xmas shows lol. I have always loved the “Golden Turd” storyline on AD. I think it is a way for the writers to fill up a show when the main story is too short for the half hour. It would be cool to perhaps add a questline where various Quahoggers try to “steal” it from one another (sans the killing, of course and finally ending with Roger repossessing it as the final task). Speaking of a turd; is any one else not being allowed to store their characters. I put them all away, and then when I come back a couple hours later, they are all back out on the street? its like herding cats with all the characters I have. I went a head and logged an issue about this, but was not sure if this was specific to me. It was a fail safe just added yesterday to keep players from being locked out of their games until the permanent fix is sent. As one of the “PlayArea Addicts”, I can say it’s much less annoying to not store characters than to be locked out of your game for days. 🙂 Although I do kind of wish I could sell Vinny. Is the challenge límited only for this week? I mean, will the challenge dissapear this week, or when the event finishes? When is Stan gonna have new quests to complete his family? I’m just on the last Stan & Roger task now, so I’ll have the turd in a few minutes! And with that, done with all the tasks for this week! Roll on Week 2!